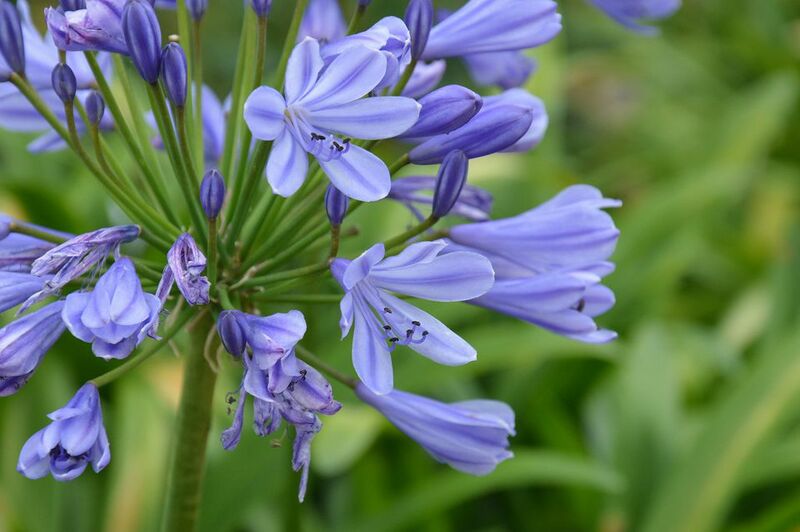 The Agapanthus sometimes called the blue African lily or just African lily is a wonderful plant for the right spot. A mature plant has strap-like leaves growing in a dense clump and then bursts into a succession of flowers in the late spring through the summer. The flowers rise above the main body of the plant on long stems and nod gracefully over the leaves. The typical color is blue. The key to growing Agapanthus well inside is to provide plenty of light during the growing season—which can mean full sun, or as near to full sun as you can manage. If you can satisfy this requirement and take care of a few basic watering rules, you'll almost be guaranteed to have a splendid display of flowers throughout the summer months. Light: During the early spring, move to a very bright, sunny position. Many people even move them outdoors to patios throughout the summer months to enjoy their blooms. In the winter, a cool, somewhat dimmer room is perfect. Water: Begin in the spring, start watering regularly and keep it coming throughout the bloom. In the winter, after the flower heads have died back and the weather is cool, move the plant indoors and almost totally suspend water while the plant is resting. Soil: A rich, peat-based potting soil is fine. Good drainage will help. Fertilizer: Feed with a weak liquid fertilizer beginning in the spring and up until flowering. During flowering, suspend feeding and cease feeding in the winter. These plants bloom more aggressively if they're slightly stressed out. Agapanthus is easily propagated by divisions. In the springtime, dig out a clump of plants and plant in a new container, then water well and move to a warm spot. This is helpful, too, in reducing the need for repotting regularly. Agapanthus blooms better when slightly root-bound, so there is no need to repot annually. In general, depending on the size of the container and the rate of growth, you might only have to repot every four years or so. If you're worried that the plant seems crowded, take a division in the spring and pot into a separate pot, but leave the "mother" plant intact. One of the great advantages of these plants is the massed effect of flowers. The most common species is A. Africanus, which is a fairly large plant for indoor cultivation. It features flower stalks that easily rise two feet above the soil level and form a striking display. The other species sometimes seen is cultivation is A. orientalis, which is even larger than its cousin, with flower stalks that can rise three feet above. Both species do best if planted in a large tub and allowed to fill it in. Agapanthus is a great plant for a large tub on a wheeled tray. In the summertime, wheel the plant to your patio or balcony and let it bloom vigorously. It's guaranteed to attract loads of attention. In the winter, wheel the plant inside to a cool room (even as low as 45˚F) with much less light while the plant rests and dies back. New growth will emerge in the spring, and the cycle can start over again. These plants appreciate ample water in the summer, but very little water in the winter. Be careful not to waterlog the plant as this can encourage root rot under the soil level and eventually kill the plant. These plants are not particularly vulnerable to pests but look for the typical signs of infestation, such as tiny webs that might indicate mites.